The successful apartment community from Renaissance Properties and Blue Star Group offers up to 1,201 sq. ft. of living space with onsite Lifestyle Center. The Hub at Metuchen has limited availability on select home designs. 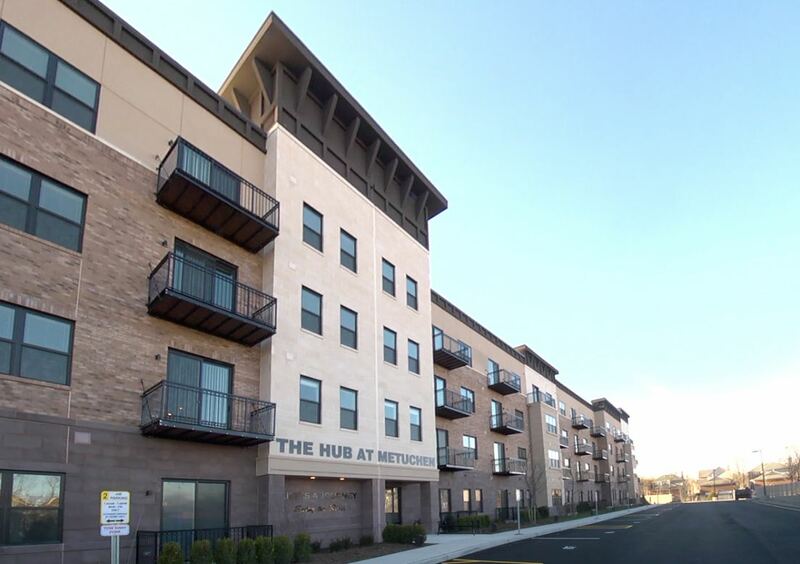 METUCHEN, N.J. - April 15, 2019 - PRLog -- After making its official debut last month, The Hub at Metuchen, a new one- and two-bedroom luxury apartment community from Renaissance Properties and Blue Star Group, is leasing quickly and has limited availability on select home designs. Those interested are invited to visit TheHubAtMetuchen.com or call 732-970-1033 for availability. "The popularity of the apartments in this new luxury community is leaving little room for hesitation as many of the most sought-after home designs are now in short supply," said Robert Adinolfi, Chief Operating Officer at Renaissance Properties. "Once you visit and take a tour, it's easy to see why availability is dwindling at The Hub." The community currently has two A1 home designs left on the third floor, featuring one-bedroom, one-bathroom, 833 sq. ft. of living space, nine-foot ceilings and a balcony – priced at $2,050 per month. Also remaining is one B3 home design on the third floor with two bedrooms, two bathrooms, nine-foot ceilings and 1,077 sq. ft. of living space – priced at $2,550 per month. Lastly, there is one Unit C home design on the third floor with two bedrooms, two bathrooms, nine-foot ceilings and 1,051 sq. ft. of living space – priced at $2,525 per month. This commuter-friendly project boasts urban conveniences and caters to residents with active lifestyles. Nestled in Metuchen's reinvigorated downtown retail district, The Hub at Metuchen offers various one- and two-bedroom floor plan options to choose from in a bike-friendly atmosphere with walkability to local shops, restaurants and the Metuchen train station. Apartments feature luxurious interiors with stainless steel appliances (including a gas stove); a washer and dryer in every unit (full sized, front load and digital); espresso colored wood cabinetry and quartz countertops in all kitchens and bathrooms; designer bathroom tile work; window blinds, and large or Juliet balconies (per plan). There is also a Smart Lock Apartment Entry System, which include two systems: ButterflyMX (secure, convenient property access from smartphones with video, audio and text messaging) and Latch Locks – M Series (the ability to open and manage the door to your apartment and the various amenities and common spaces from your smartphone). The pet-friendly community also offers the following lifestyle amenities: A 24-hour concierge system for packages; a 24-hour Lifestyle Center; a Fitness Center and Yoga Studio with "Fitness-On-Demand", and complimentary WiFi in the Lifestyle Center, Fitness Center and Yoga Studio. Additional amenities include: Onsite parking permits for uncovered spots, assigned covered parking with or without additional storage are all available for an extra fee; indoor bike storage; a Pet Spa; onsite retail shops and 24-hour emergency maintenance. The Hub at Metuchen is located in a bike-friendly atmosphere at the center of Metuchen's downtown retail district. With a walkability score of 82, future residents will be able to walk to local shops, restaurants and the new Whole Foods Market, directly across the street. The Middlesex Greenway is also just steps away from The Hub, allowing residents to enjoy miles of green trails for walking, jogging or biking. The Metuchen Train Station is just a 10-minute walk away, and New York City is easily accessible by car in just 45 minutes. The Hub at Metuchen is located at 658 Middlesex Avenue, Metuchen, NJ 08840. Apartment applications can be submitted online or in person at the leasing office. Those interested are encouraged to call 732-970-1033 to tour the community's decorated models and newly completed lifestyle center. Since its creation nearly 30 years ago, Renaissance Properties has evolved from a small real estate brokerage company to a multi-faceted real estate development firm and home builder with over 1,000 new homes and nearly 800,000 square feet of commercial space to its credit. The dedicated team at Renaissance Properties works tirelessly to ensure quality, integrity and customer satisfaction in all its endeavors. With distinctive designs and accommodating layouts, new home buyers and tenants alike are delighted with the product offered by Renaissance Properties. To learn more, visit http://www.RenaissanceProp.com.